The study of normal, aberrant, and dysregulated proteins (proteomics) is now becoming an established technique in biological research. Proteomics has been widely applied in biological investigations of systemic cancers and also in high-grade gliomas (HGGs). 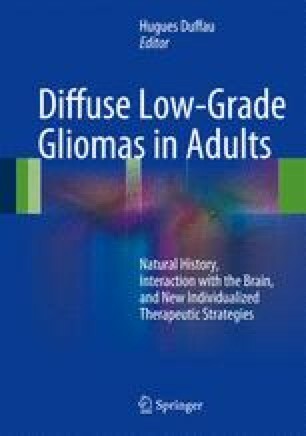 However, relatively little work has been done on questions evaluating biological aspects of low-grade gliomas (LGGs). In this chapter, the proteomic literature on LGGs is critically and systematically reviewed. Protein lists from individual studies are summarized, and differences between “control” brain tissue and LGG, LGG and HGGs, LGGs with and without 1p/19q deletions, and the impact of IDH1 deletions are evaluated. Web-based bioinformatics tools, IPA and DAVID, are also used to assess protein-protein interactions between proteins differentially expressed in LGGs. Two highly significant and important functional protein networks are identified. One in silico network reveals underlying differences between LGG and control brain, and the other reveals underlying differences between HGGs and LGGs. The roles of cell proliferation, apoptosis, and aberrant subcellular processes are highlighted. In addition, the nascent literature on 1p/19q, and IDH1 deletions is reviewed. The findings from these studies show that systematic analysis of proteomic data in LGGs is much more informative than data derived from single studies. The lack of consistent proteomic differences identified between the various studies also highlights problems in proteomic methodologies and investigative study design. The results from this review provide novel insights into LGG biology and give some direction for focus of future studies. Gerth and Deighton are contributed equally.